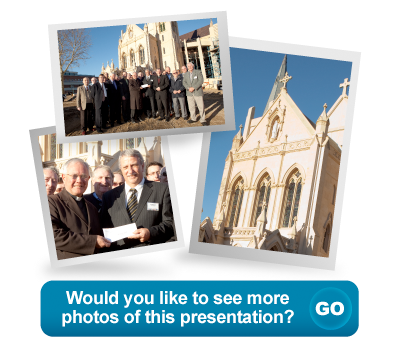 In 2007, following a personal request by Archbishop Hickey, The Knights of the Southern Cross WA generously pledged $1 million to fund the provision of the restoration and expansion of the historic organ at St Mary's Cathedral. Since that time, the Order has continued to honour its pledge by providing significant contributions twice a year. Members of the Knights State Council and Branch Leaders were invited by Monsignor Michael Keating and Monsignor Brian O'Loughlin (Chaplain to the Order) for a special tour of the Cathedral. Representatives of the Order took the opportunity to present a cheque for $75,000 to Monsignor Keating, Chairman of the St Mary's Cathedral Appeal, a further contribution towards their overall $1 million commitment.